The last-ever space shuttle launch — that of Atlantis, scheduled for July 8 — will come just over three decades after the first one, which took place April 12, 1981. But that's not to say NASA's iconic shuttle program just turned 30 years old. It's actually pushing 40, since President Richard Nixon officially announced its existence in January 1972. And the shuttle's roots go much deeper than that, stretching all the way back to a 1930s concept vehicle the Nazis hoped could drop bombs on New York City. In the late 1930s, the Nazis initiated the "Amerika Bomber" project, an effort to build an aircraft capable of taking off from Germany and dropping a bomb on the continental United States. Various engineers, including a man named Eugen Sanger, submitted proposals. Sanger's idea, developed with the mathematician Irene Bredt, was a type of winged rocket called the Silbervogel (German for "silver bird"). The reusable Silbervogel would ascend to suborbital space, then drop down into the stratosphere. At that point, the increasing air density would give the vehicle lift, bouncing it to a higher altitude again. The process would repeat, with the Silbervogel making the trip across the Atlantic in a series of leaps and bounds. The Nazis didn't end up building the Silbervogel, or any other Amerika Bomber proposal. But the Silbervogel concept found its way into American hands at the end of World War II, when the United States brought over many German scientists in a mission known as Operation Paperclip. "The Bureau of Aeronautics in the Navy got very excited about these ideas and started to pursue them," said Roger Launius, space history curator at the Smithsonian's National Air and Space Museum. Also intrigued, he added, was NASA's predecessor, the National Advisory Committee for Aeronautics (NACA). "There was a series of studies after the war that followed up on Sanger's idea," Launius told SPACE.com. These studies soon morphed into bona fide vehicle development programs, with the U.S. miltary, NACA and NASA (which was established in 1958) all taking part. The X-15 rocket plane flew 199 times between 1959 and 1968. The X-15 rocket plane was one result. This vehicle made nearly 200 test flights from 1959 to 1968. It reached outer space, which officially begins at an altitude of 62 miles (100 kilometers), on several occasions. And the X-15 still holds the world record for fastest manned rocket-powered aircraft, reaching a top speed of 4,520 mph (7,274 kph) during one 1967 test flight. Around the same time, the U.S. Air Force was working on the X-20 space plane, known as the Dyna-Soar. This vehicle — similar to today's space shuttle in design — was slated to be used for a variety of purposes, including reconnaissance and satellite maintenance. The Dyna-Soar was almost built, but not quite. The program was cancelled in 1963, after construction had already begun. "They bent metal," Launius said. "They were going to fly." An X-20 Dyna-Soar (Dynamic Soaring) clears the launch tower atop an Air Force Titan II rocket in this 1961 artist's concept. The X-20 development program was cancelled in 1963, and the vehicle was never built. Development of the X-20 and the Dyna-Soar, along with other vehicles such as the HL-10, helped lay the foundation for the space shuttle program shortly thereafter. As the 1950s wore on, reusable shuttlelike space planes were increasingly viewed as key to the nation's ability to access, explore and exploit space. Their importance was cemented in the so-called "von Braun paradigm," an idea widely circulated at the time by the famed German rocket engineer Wernher von Braun. Von Braun came to the U.S. as part of Operation Paperclip and quickly jump-started the nation's rocket-development programs. Space exploration, in the von Braun paradigm, should involve the following sequential steps: Put a human in space; develop a reusable spacecraft, making access to space cheaper and easier; use this vehicle to build a space station; inhabit the space station and employ it as a base from which to launch manned expeditions to the moon and, later, Mars. NASA took this vision to heart, using it as a road map when charting its course in the late 1950s, said Valerie Neal, curator for contemporary human spaceflight at the Smithsonian. So if NASA had visions of space planes dancing in its head in the 1950s, why did the nation wait until 1972 to officially begin the shuttle program? The Space Race intervened. At the dawn of the space age, the Soviet Union handed the United States two stinging defeats in quick succession. First, the Soviets launched the world's first artificial satellite, Sputnik, in October 1957; then they put the first human in space, Yuri Gagarin, in April 1961. In response to the Soviet challenge, President John F. Kennedy settled on a bold plan in May 1961: To put a man on the moon, and bring him back safely, by the end of the decade. Thus began the Apollo program, an all-out race to the moon that impelled the United States to skip over some of the von Braun paradigm's early steps. Because rapid progress was of the essence, space plane development was back-burnered in favor of well-worn vehicles like capsules. "They kind of fell back to a technology that they understood better — ballistic re-entry and parachutes, which is a much lower-tech approach," Launius said. In early 1969, President Richard Nixon had established a space task group to help determine NASA's post-Apollo direction. In September of that year, the group delivered its report, which recommended going back to the von Braun paradigm in some fashion: shuttle, space station, manned moon trips and, finally, manned missions to Mars. Nixon was not pleased with this recommendation, Launius said. The president thought the plan was far too expensive for NASA's budget, which had been cut from a high of $5.9 billion (4.4 percent of the federal budget) in 1966 to $4.25 billion (2.3 percent of the federal budget) in 1969. So he zeroed in on a single aspect of the von Braun paradigm, ditching the others. "The one stand-alone thing that you can point to was the shuttle," Launius said. "So that's where they went." The decision marked a key shift in NASA's charter from space exploration to space utilization, Neal said. In announcing the shuttle program to the nation on Jan. 5, 1972, Nixon stressed its practical benefits, saying it could help the United States get to space frequently and relatively cheaply. Presumably, further advances would follow on from this ability. 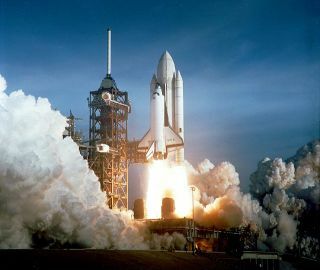 "The space shuttle era was all about making space familiar, and making it our home and our workplace," Neal told SPACE.com. Meanwhile, NASA's funding kept drying up. By 1972, Nixon had cut it to $3.4 billion (1.6 percent of the federal budget). NASA's original vision for the space shuttle was a fully reusable, two-stage vehicle that would be piloted in both stages, Launius said. The hypersonic, winged first stage would carry the shuttle orbiter on its back, up to an altitude of at least 50,000 feet (15,240 meters). The first stage would then fly back to Earth and land like an airplane, while the orbiter cruised into space. "It's '60s and '70s technology," Launius said. "People at NASA didn't think they'd be flying that shuttle through 2011." The first space shuttle, named Enterprise, was rolled out in September 1976. Enterprise made some glide flights in 1977, but never reached space. However, the second orbiter to come off the line did. Columbia blasted off on April 12, 1981, and the rest is history. And after Atlantis touches down next month, the shuttle program will be history, too.